Located near Annan in Dumfries and Galloway, Chapelcross was one of the oldest nuclear power stations in the United Kingdom, and the first in Scotland. Built on part of the former RAF Annan, a wartime air-training base, the station became operational in 1959 and comprised four 50 megawatt Magnox reactors, together with a processing plant. The Magnox reactors, so-called because magnesium alloy was used to contain the fuel rods, were designed to produce weapons-grade plutonium for the military, as well as power for the civilian market. With 450 staff, Chapelcross was one of the largest employers in Dumfries and Galloway, operated by the government-owned nuclear contractor BNFL. Although its operational licence was extended until 2006 (in 1996), the discovery of a 40-year-old 20cm 'hairline crack' in one of the four heat exchangers caused the plant to close for six months in 1998. A further incident occurred in 2001 when radio-active fuel rods fell down a shaft and, later, the unrelated discovery that some of the graphite moderators in the reactor core were warped. Reports of high levels of leukaemia in the area (1987) have been challenged in later studies. 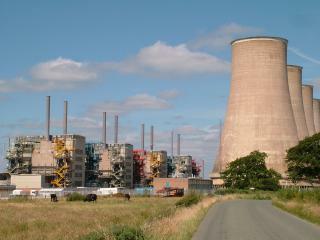 The viability of the station was dependent on the continued export of electricity to England, but falling prices and operational problems meant Chapelcross generated its last power in June 2004. A lengthy decommissioning process is necessary, but the four distinctive cooling towers, which had become a familiar landmark, were demolished by controlled explosion in May 2007.